Not all sunscreens are created equally. Traditional sunscreen ingredients are an imperfect shield against ultraviolet (UV) light, regardless of the skin protective factor (SPF). 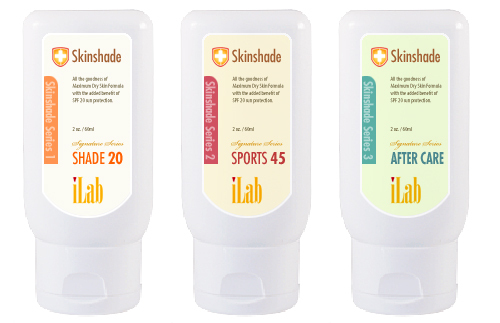 iLab SKINSHADE was developed to fill the void left by traditional sunscreens and provide comprehensive UV protection. Skin protected and repaired with iLab SKINSHADE will stay healthy longer and age more slowly than with any other sunscreen product. 1. It surveys for DNA damage created by UV light and fixes it with T4 Endonuclease V by penetrating into the DNA to correct errors in the chemical bonds. 2. It protects the dermis from further damage by preventing the activation of an enzyme system that breaks down collagen, elastin, and hyaluronic acid - all key elements for healthy skin. All the goodness of skin formula with the added benefit of SPF 20 sun protection. Light, pleasant and easy to apply, you won't believe it's a sunscreen. 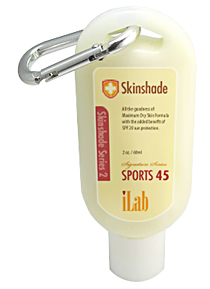 iLab SKINSHADE 20 blocks 92% of UVA and 98% of UVB rays. It is supplemented with vitamins A and E to protect the skin against free radical damage, plus safflower oil, aloe vera, chamomile, and cucumber extracts that moisturize and sooth the skin. It is aborbed easily into the skin and is unscented. iLab SKINSHADE is PABA-free. Won't drip into eyes. Directions: Apply to entire face and body whenever you will be exposed to the sun. Re-apply periodcally throughout the day for continuous protection. A broad spectrum water resistant sunscreen with zinc oxide and titanium dioxide to protect against both UVA & UVB rays. Won't drip into eyes, making it ideal for use when participating in outdoor sports or exercising. When out in direct sun it is important to re-apply your sun protection every two hours or after swimming. Our moisturizing NON- SPF lotion with Green Tea Extract, Aloe Vera Leaf Juice and other natural ingredients soothe the skin after a day in the sun. They combine to help improve the youthful appearance of your skin - fighting off free radicals that occur from the elements such as effects of the sun, harsh cosmetics and pollutants. Green Tea also is known as one of nature’s strongest anti-oxidants.